The ideal golfing gift for the enthusiast you know set amongst the wonderful rolling surrounds of the Hunter Valley - if there's a better golf gift in regional NSW, we'd like to know about it! 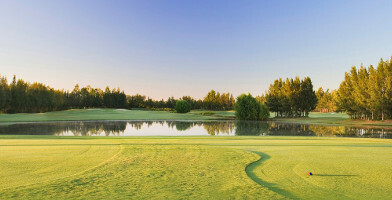 Set amongst the vineyards of the lower Hunter Valley, the friendly and immaculately-maintained Hunter Valley Golf Course and Country Club course offers stunning views, beautiful wildlife and a relaxed atmosphere. Extensively renovated back in 2003, the course now also includes conference facilities, self-contained golf condominiums, a fully-equipped pro shop, health and beauty centre and an alfresco bar and restaurant that overlooks the breathtaking Brokenback Mountain Ranges. Set amongst the vineyards of the lower Hunter Valley, this quality golf course offers stunning views, beautiful wildlife and a relaxed atmosphere.